Place flours, yeast, sugar & salt in a large mixing bowl. Stir in milk, followed by oil and egg. Add about 1/4 cup bread flour until dough forms a mass. Place dough on floured surface and knead 50 turns. Cut dough into 15 or 18 pieces. I use a scraper, cutting the dough into thirds and then cut each third into five or six pieces. Shape into balls and place in a greased or parchment-lined 13 x 9-inch pan. Cover and let rise in a warm spot until the rolls double in size, about 45 minutes. Meantime preheat oven to 350° F. Bake for about 14-16 minutes. Note: For more details and step-by-step photos, click here. Want To Make Them Ahead? See Joslyn's comment below. 40 Comments on "Whole Wheat Dinner Rolls"
I experimented with sugar substitutes for bread many years ago. And then I checked on the Internet about sugar substitutes and bread and read that Splenda and many others kill the yeast so your bread won’t rise anyway. So I stick to honey or a very small amount of sugar. Or make no-knead bread which uses no sugar. Knowing I wouldn’t have time to make your Whole Wheat Dinner Rolls for Thanksgiving, I did a little experiment. I made the dough, rested it 10 minutes, and shaped into rolls. I placed 8 rolls in each of 2 greased cake pans, covered with a towel and allowed to rest 45 minutes. I baked one pan then and covered the second pan with non-stick foil and placed in the refrigerator about 20 hours. The rolls I baked were great! The next day I placed the refrigerated rolls on the counter, loosened the foil and allowed to come to room temperature, about 2 hours, and then baked them. I’m happy to say the refrigerated rolls turned out PERFECT!!! Now Thanksgiving Day will be a little less hectic! Thanks, Jenny, your recipes are the bomb! How nice of you to share this right before Thanksgiving. Thank you. Your welcome, and THANK YOU for all your AWESOME recipes! OOPS!!! I forgot to mention I used dry active yeast, not fast acting, and my milk was about 125F degrees. You are a great baker. You could post some vegan recipes. I would be very happy. I’ve been making this bread recipe for about a year now, and have never been disappointed. I just tried the dinner buns yesterday for the first time, and found the hardest thing was the making them too big/too small but I’m sure that repetition will soon correct this problem. I even had two left that wouldn’t fit in the pan, so not wanting to waste any, I popped them into a muffin tin, and baked them. They also turned out good. I’ve never commented on a blog or site besides social media before, but I HAD to come back by and leave one here. I’ve been making the bread from this recipe for several months, and we love it. I decided to try these rolls for Sunday dinner today and Oh. My. Goodness! They were delicious! I cannot stop eating them! I definitely need someone to come take the pan away, lol! These were so quick and easy to do. Thank you, thank you, thank you for sharing your talent and expertise. You have taken the intimidation out of bread making for me! Thank you so much for your generosity in sharing your knowledge so freely. Many blessings to you and yours! I double this recipie all the time and give the other batch to friends or neighbors. This recipie is perfect and so easy to follow. My favorite! 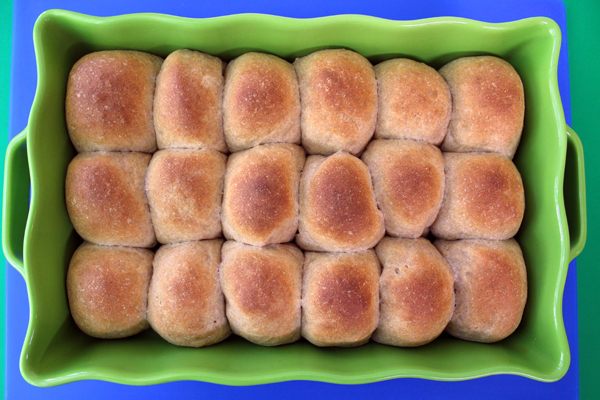 Watching rolls rise, but they’re rising. There was a point where I hadn’t used enough flour that it became a blobbed soggy mess. A bit more flour at a time did the trick. Love this recipe. Thank you so much for sharing this. Also, love the green casserole dish you are using. Where can buy this? Use white AP flour, add a bit of cinnamon, a pinch of nutmeg and a couple of mashed bananas. Don’t bother letting it rise – just cook it in a waffle Iron (I used a Belgian waffle maker) . Top with a few fried banana slices and whatever else you like. Seriously. 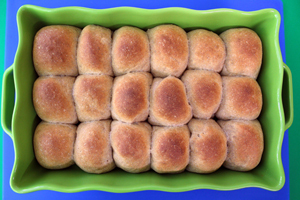 I hadn’t tried this recipe for rolls, but I had with wheat bead. I used 2 1/2 cups of white flour and 1/2 cup of wheat flour instead and they are perfect. utensils. Where did you get that timer? Trying the recipe today! Just made these…so easy and so delicious! Thanks for the recipe. Trying ciabatta next. I tried your apple pie (from scratch) Amazing, it was easy, no fuss and we enjoyed it for a few days! My hubby just loves apple pie! Have never tried bread but am hoping to get started on this one soon! Hey Jenny! decided to try the roll version of wheat bread. Got 5 guests coming for TG and I figure if I don’t get them to come out right no one will notice since we should have enough food to take some to the homeless shelter. I have become addicted to your recipes. And now I’m feeling much more comfortable making bread. I’ve done the no knead versions of different types several times since I started baking in Oct. Rye is my favorite. TY so much and I’ll let you know how the rolls turned out. Can I replace the milk with soymilk or water? Looks delicious, but I need nondairy. i have made this bread often with water instead of milk. The rise is a little slower but it turns out great. Enjoy! I just did a double batch in one bowl. I did increase the kneading time by two. So 100 turns and 5 minutes on the dough hook just to be sure. Came out great, got 32 rolls. When you doubled the recipe, did you you double the yeast too? appreciate a quick response, as I plan to double the recipe and unsure whether I should double the yeast. appreciate your help. Are all yeast rolls made with whole-wheat? Rolls can be made with whole wheat flour, bread flour, all purpose flour, and even other grains. All of my yeast recipes are posted here but you can probably find what you are looking for with an internet search. Today I baked my first bread! I used multi grain whole wheat and added some flax seeds and crushed dry oregano. It rose 1 inch above the pan as mentioned but did not rise much in the oven after that. But it was an awesome fluffy bread with crunchy crust. I have a question, can this recipe be doubled in case I use two loaf pans? Many thanks in advance for any help you may provide. Great recipe! The rolls look delicious. I was wondering if there is an egg substitute for this recipe as I dont eat eggs. I don’t know of a good egg substitute but there are a lot of different bread recipes that don’t use eggs. It’s pretty easy to send a photo using this link: YourPhotos@JennyCanCook.com (you can just drag the photo into the body of the email).